After a rather chilly August bank holiday weekend in Ireland it is back to the market. 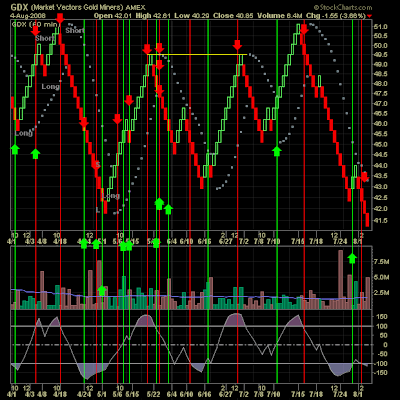 I'll start with a belated weekly Stockcharts.com review - although yesterday's action was more telling than last weeks. Use Extreme Caution Here! This market can go either way now! The selloff today came right down to the key rising support trendlines on the DJIA and the S&P 500 in the 60-minute timeframe. There are now mixed signals between the 60-minute and daily charts. The 60-minute charts have now reset with the MACDs near zero and the stochastics oversold as prices are resting on the rising trendlines. I am watching the MACD rising trendlines in the 60-minute timeframe to see if we get a bounce off of them. 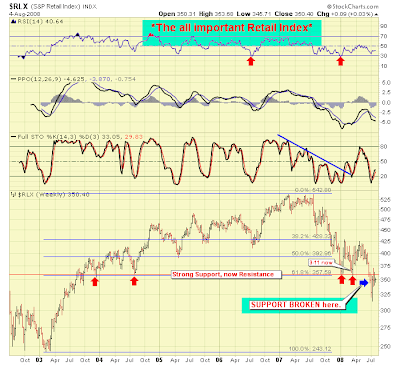 However, the daily charts have troubling signs that suggest that prices test the July 15 lows. The daily index charts have full stochastics (14,3,3) confirming a lower high and getting a bearish cross. Notice the DJIA and the Russell 2K directly below. However, the selloff that we have been witnessing has been on light volume the triangle patterns on the 60-minute charts remain in tact. The Aroon down on the S&P 500 daily chart continues to fall, which is a positive. But the Russell 2K already got a bullish Aroon cross. 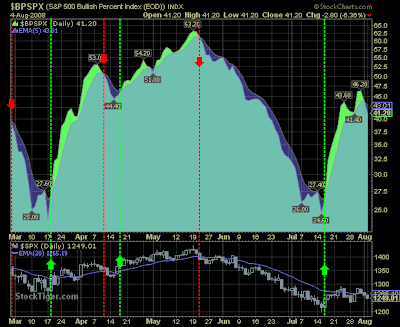 Should prices test the July 15 lows that bullish Aroon cross could be jeopardy. It is interesting that the daily and weekly charts are giving mixed signals also. 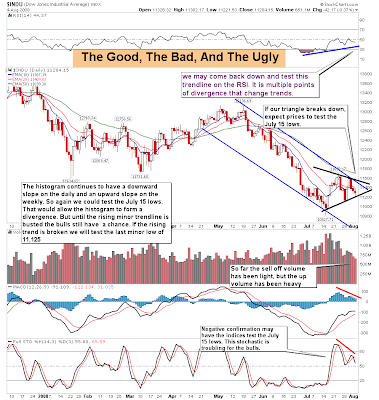 With the daily index charts suggesting weakness, while the weekly charts continue to sport a divergence between the histograms and their price charts. Again, we could form a double bottom if the minor trend is busted. But if that pattern fails to appear if the current minor trendline is broken, then the bears will get their bear market. The average decline in the last 9 bear markets has been approximately 32 %. So it is possible that the if we test the July 15 lows and break them that the market could in fact drop another 12 to 20 percent. I am optimistic, but should that happen then the bears would have a legitimate case for the market to drop at least another 12 %. But should the S&P 500 rise and break above the 1350, which is the downward trendline on the weekly chart it would do severe technical damage to the bears case. Again, I don?t think they will get their 32 to 40 % decline, but I will concede their case should the July 15 lows be significancy violated. There is certainly enough panic in this market and pessimistic spirit to get the bears job done. The market has moved lower than I anticipated. If a selloff does occur tomorrow (today), it would likely be that the Fed leave interest rates alone and investors panic over inflation concerns once again. So lets listen to the Fed announcement tomorrow (today) and see what happens. 8/4 -- Several of the short term uptrends off the July lows are now failing (QQQQ, RUT), though more sideways than down. 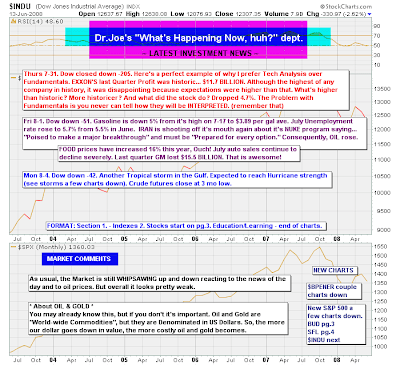 The Dow was adjusted not to show a break quite yet because of the bounce back so far. The weight of evidence thus says that the upchannels off the lows are flattening at best or could already be in downchannels again. VIX is moving up to confirm the weakness. What's intersting is that the commodities are getting hit at the same time. XLE stocks are having a whopping correction. Watch the triangle in the XLK hourly -- if the techs crack, it could be steep. 8/2 -- The short term upchannels off the mid-July lows continue, but they are questionable as to their true slopes (alternatives are shown)and as to how much further they can go. Also, they are wide, meaning they can confuse with lots of seesaw action inside without changing their overall direction. If you look at the Dow's one-year chart, you can see the nature of the rebound off the January lows and how fickle that was for two months before a sustained rally kicked in. I suspect we're also in fickleville now. Watch the minis for clues - they are changing direction every 3-5 days. If the market's going to rally further, you have to wonder where the leadership will come from. Small caps have rallied better and in the longer picture are in better shape than the large caps. Oil and gold stocks have corrected substantially. XAU (golds)still looks weak though, but XLE (oils) is showing positive signs. 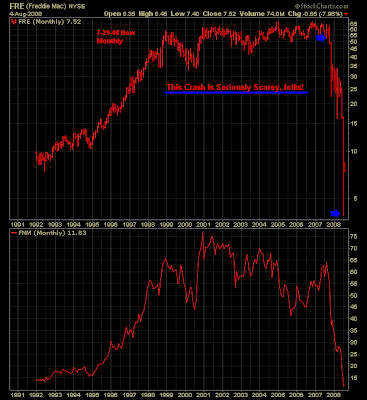 Financials have bounced too far in my estimation, and I still can't see them leading things upward. The XLK (techs)has a very bearish wedge formation that could lead to a sharp decline. So, all in all, remember that the longer term picture in the major indexes is still clearly in the downtrends that began last October and that all of this short term action is countertrend rallying. That means that without reason to rally, you get pulled back down by the larger trend.